A two-vehicle crash in the Brentwood-Darlington neighborhood ended with a man taken to the hospital, a mailbox mowed down, and a split-rail fence shattered – at 10:59 a.m. on February 26, at S.E. Harney Street and 76th Place. A silver Honda Odyssey was apparently broadsided by a Red Chevy Blazer – which still had the Honda's trim stuck in its bumper. An officer at the scene said he didn't know the extent of the Honda Driver's injuries – but, after being checked out by paramedics, the man was taken to a local hospital "as a precaution, for medical observation". 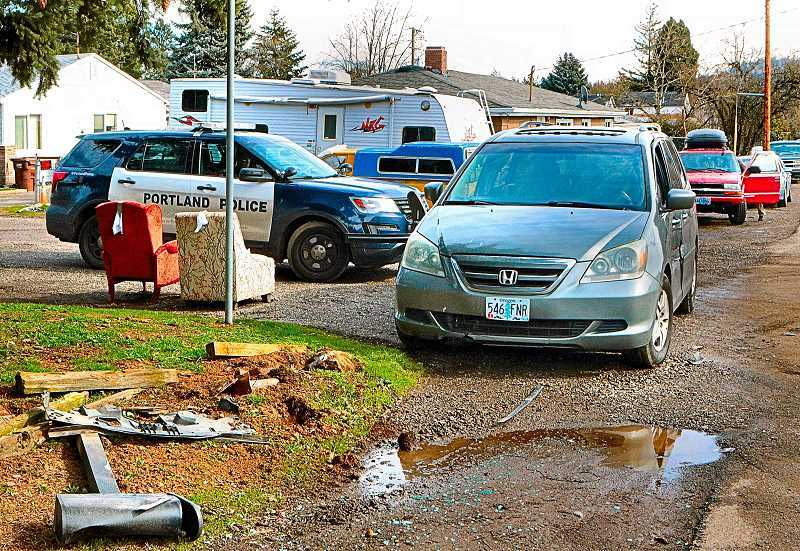 The officer added, with some irony, "The Honda's driver said he'd rented it to haul some furniture, because his own vehicle had just been destroyed in a hit-and-run accident."